The name Porsche stands for the highest quality. It always has the objective of satisfying the customer to the utmost degree – as befits a premium brand. It would be easy to say, “Porsche is quality”: in every way, in all characteristics, in all products, in customer relations, and in terms of brand. Any other questions? Yes – there is a whole world of questions out there. For example, what is so special about Porsche quality? Why is it so good? How is it achieved? How can we experience it and observe it? It all comes down to the fundamental question: What makes Porsche quality so special? An absence of defects is unquestionably what all manufacturers of high-end products are striving for. They want to provide perfect function, aesthetically packaged, properly manufactured, and long-lasting – and well thought out and user-friendly. That’s all mandatory and for a premium manufacturer like Porsche, it’s a given. Willingly going the extra mile to achieve perfection is the brand’s added value, but what else makes Porsche stand out? How about seven special seals of quality? Seven characteristics that individually and collectively distinguish Porsche’s originality and highlight the uniqueness of the brand and its products? A routine day can be rough. Once customers start using a product they have acquired, they are in fact testing it continually. They have rigorous criteria and are unflinching in their judgment. Testing companies and organizations do the same thing on behalf of consumers. They have even more stringent criteria and even more unrelenting judgments. If a manufacturer gets their approval, they’ve really accomplished something with their product. That’s how Porsche has always been. For example, J.D. Power & Associates conducted an Initial Quality Study in 2013, which examined product quality down to the smallest detail. In the industry’s most well-respected worldwide audit, Porsche won once more in two categories, with the 911 and the Boxster. The Cayenne and Panamera came third in their categories. With those results, Porsche has the best brand rankings of all car manufacturers. This kind of success is no coincidence. Porsche pays close attention to product evaluations, whether they come directly from customers or independent institutes. And it makes a point of implementing relevant changes as quickly as possible – sometimes in record-breaking time. For example, some customers complained that the Cayenne only had the central locking switch in the center console. Believe it or not, 13 weeks later, every new Cayenne had switches added to both front doors, thus giving owners an additional feeling of security. Porsche built its first car in 1948. The tradition thus goes back more than 65 years. That alone doesn’t merit a top score because there are much older car makers. However, they cannot make the same claim as Porsche: Most of the vehicles it has built, two-thirds in fact, are still on the road. Quality creates value. Stand back and admire it, better yet, drive it for years, decades even. This particular quality is testimony to previous eras as well as the company’s creativity and engineering work. Porsche considers this fact an honor and an obligation to keep building cars in the future that are worth preserving and are preserved – with great care. Indeed, that is made possible due to their quality and the accumulation of many other factors such as technology, design, reliability, and durability – all of which have earned the trust of customers. And then one also has to consider the fact that quite a few Porsche models represent an extremely good investment. Take the 911 RS 2.7 for example, which cost 34,000 deutschmarks in 1973; an original model in good condition would currently fetch at least 350,000 euro. Many sports cars are sporty, but every Porsche is a perfect athlete. Two of the most important ingredients that substantiate this claim are the drivetrain and the chassis. For the Porsche brand, these are clearly some of the most critical seals of quality in every model, and that is why every new development also sets new benchmarks in these areas. At the same time, the drivetrain and the chassis explain the outstanding Nordschleife track times: 6 minutes and 57 seconds. A stopwatch says it all: that is the time a 918 Spyder needs to run the legendary Nordschleife of the Nürburgring. No street-legal sports car is faster on that course. And that makes it the absolute leader. 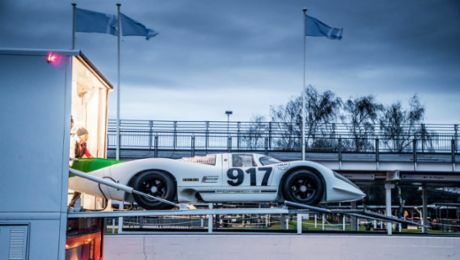 True to the motto of “There’s a racing car in every Porsche,” every model ranks at the top in its segment when measured by the Nordschleife yardstick. The Nordschleife time itself thus perfectly expresses Porsche quality. It reveals at first glance all the aspects of sportiness and race-worthiness. A second look uncovers deeper aspects. To achieve these superb timings, all of a vehicle’s systems and components must interact at the highest levels. The engine, transmission, chassis, steering, aerodynamics, weight distribution, and ergonomics are the most critical factors, closely followed by safety and reliability. This refinement and ambience can truly inspire a driver to call upon maximum performance and bring it to the road. Pure Porsche is the sum of all its parts. If one of them is not perfectly aligned, the car will lose a few seconds on the racetrack. That’s not important in itself, but it would no longer embody the Porsche virtue of perfect sportsmanship. People who are fully dedicated to timed sports will battle for every tenth and hundredth of a second. So it’s no wonder then that a Porsche Nordschleife‘s times are a design criterion for a new vehicle and thus laid down in the specifications. That criterion becomes a “threshold operating condition” and is relevant to the design and construction – not by coincidence, but as an expression of the utmost striving for quality. It may be a bold hypothesis: a Porsche is supreme and makes for supremacy. It allows one to freely decide on one’s personal mobility, particularly in terms of balancing street and race track performance. It is something that every model offers and it is definitely something only Porsches can do. Hit the race track in a 911 in the morning and drive it to the opera in the evening. Either way, it cuts the best figure. 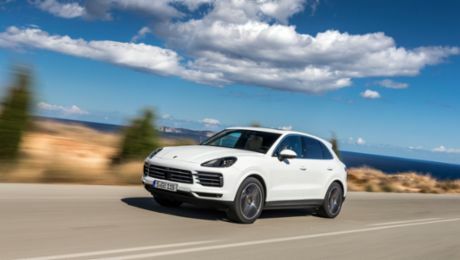 No other car maker can offer that capability in all of its models in such perfection, and thus one can say that supremacy is for Porsche a seal of quality. Supremacy is a “soft” factor, and that’s why it’s all the more important to substantiate its various aspects with facts so as to manufacture the corresponding products. This occurs for example by means of market research, which helps the brand to adapt to new markets and customers. Take China for example. Porsche has been a pioneer in that country over the last several years, doing groundbreaking work to perfectly understand the unique characteristics of this significant market. To do this, target group and market-specific studies were conducted and customers were interviewed to find out what produces the maximum level of customer satisfaction. The results confirm that customer satisfaction and enthusiasm do not stem solely from high-quality vehicles, but also from the unique quality of after-sales service and customer support. In China and for Porsche representatives, appreciative and personal contact with Porsche customers is extremely important. This reinforces the customers’ high level of trust in the Porsche brand. They can rest reassured that for any questions they may have, a solution will be offered that meets their personal requirements. A Porsche is more than a sports car. It is the most beautiful sports car in its segment. Obviously, that’s a very subjective opinion, but it’s true. It makes the point that Porsche places the highest demands on its designs and their every detail. No one item and no line are left to chance. In addition, the design is such that it presents a challenge for the engineers to transform the perfect concept into a real car. Let’s take a look at the hood of the Macan, which wraps around the wheel wells and also encases the main headlights. It gives the front of the car a certain breadth and power, emphasizing its sports car character. The designers felt that it needed to be part of the vehicle. However, the requisite larger pressed sheet metal component did not exist, and so the experts struggled behind the scenes to make it possible. The Porsche design is indeed based on the brand’s past and on cars built to date; however, every new car carries the design forward. At the same time, in every Porsche, there is still something of the 911. Let’s take a look at the interior. Historically, the interior of a vehicle has always been a factor influencing purchasing decisions. Here, too, the Porsche message has to be clearly identifiable, and it is not just limited to the traditional round instruments or the ignition key being on the left. Porsche’s interior design philosophy applies to all models and is marked by characteristic styling elements. One example is the central console that appears in all current Porsche models. The value that Porsche places on the interior is shown by the fact that the Zuffenhausen plant has its own saddlery, where experts handcraft the covering of the vehicle’s interior with high-quality leather, which can come in exotic colors and patterns. The saddlery has always been ready to accommodate the most extravagant customer requests. An automobile is a highly complex technical product. Customers expect every Porsche to embody lifestyle and utility, and to enable sports-oriented mobility at the highest level, thereby representing state-of-the-art technology at its best. This is exemplified by the variable turbine geometry in high-performance turbocharged engines. Porsche uses such cutting-edge technology so that optimum flow conditions prevail in all the engine’s operating modes. This is in line with the claim that no other cars bring sportiness to the streets like a Porsche, and without the perfect materials, a sports car cannot be successful. One can also look at the trendsetting drivetrain of the Panamera S E-Hybrid. With the first plug-in hybrid in the premium class, Porsche has set a clear standard: maximum performance with minimum fuel consumption. It is feasible and not just in the Panamera: this is the beginning of a new phase of development. In the end, there is overall quality. If customers are satisfied, then the quality is right. This means all aspects of quality: not only in the product, but also in the pre-sales and customer service support. And when customers are fully and deeply satisfied – at the only level proper for a premium car maker like Porsche – then the manufacturer has done everything correctly and has earned the customers’ trust with its top quality.